Die Gracefully Robotics - Barely Even a Proper Team. The self righting will still be using the disc, I'll just be taking what I learned from getting DHMIS to actually spinup and applying it to Test! Though the new frame would hopefully stop that being needed much anyway. It's definitely the most reliable way. DHMIS is terrifying when it spins up. I'd love to fight it just for the specatacle (of course with a good 5mm of polycarbonate up front). Not a robot, but a new tool! LASER! Bodged in air assist, running off a paintbrush compressor borrowed from my dad for now. The first few cuts before the air assist was in. I can now neatly cut 1.5mm poly with minimal discolouration. I need to do the air assist properly to really get nice cuts but the bodge has given me an idea of what to aim for. 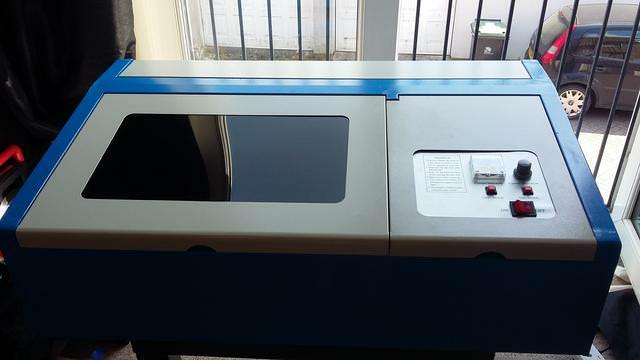 A standard K40 laser. Needs a fair bit of tweaking to get working fully, lots of parts on order to get it completed. 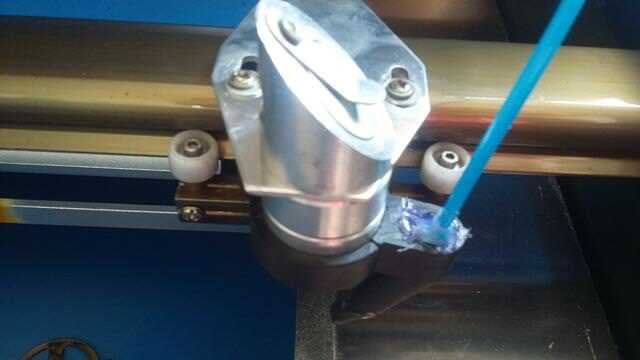 Non bodge air assist with an all around nozzle. New exhaust (Polycarb fumes are bad. That and just general smoke), Inline blower with 3" tubing straight out my house. Hopefully I can seal it enough to make enough negative pressure to eliminate all escaping fumes. New bed to put material on, the current one is pretty bad. New cooling system (Currently distilled water in a mixing bowl with a pond pump), I'm intending on what will essentially be a PC water cooling system with a hefty reservoir. New stand. So... 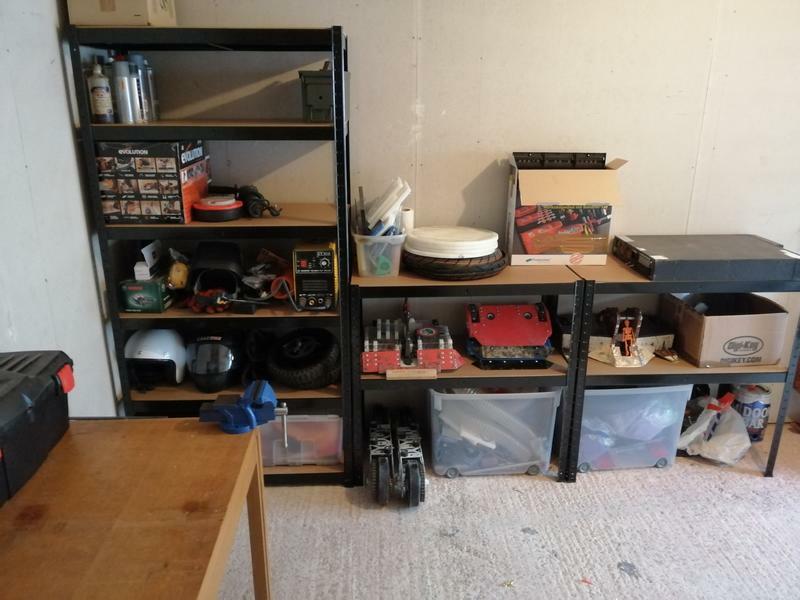 I'm actually running out of places to put tools and robot stuff. I have a 2 bed flat, one bedroom is already a full robot room dedicated to fighting robots. 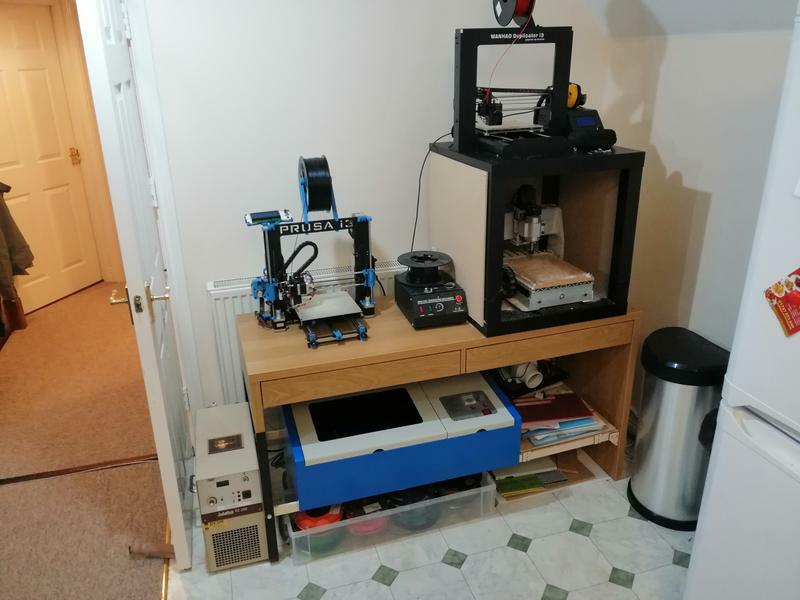 My kitchen has CNC corner with the 2 printers and router. This is going to have to live sortof where my TV currently does so I need to make a stand to hold both... And I'm unwilling to move it to the garage. 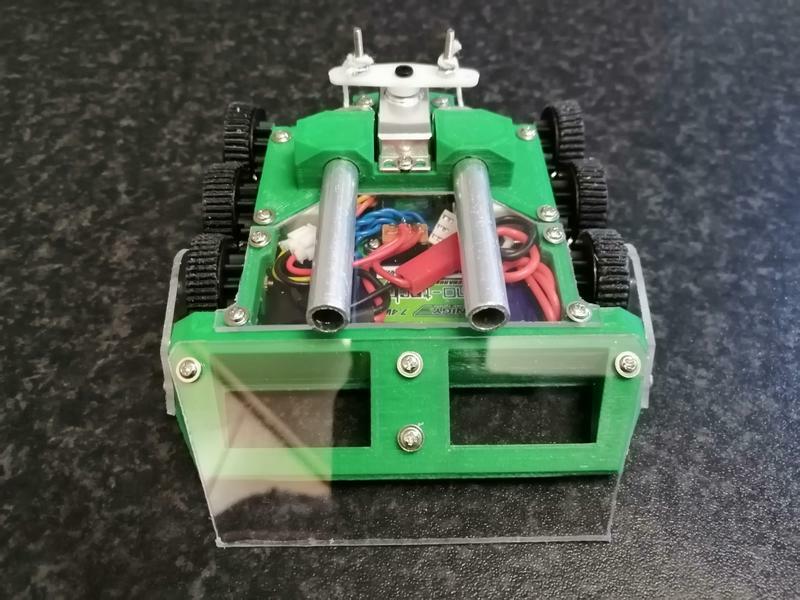 Nuts And Bots - For all your components and ready built antweights! 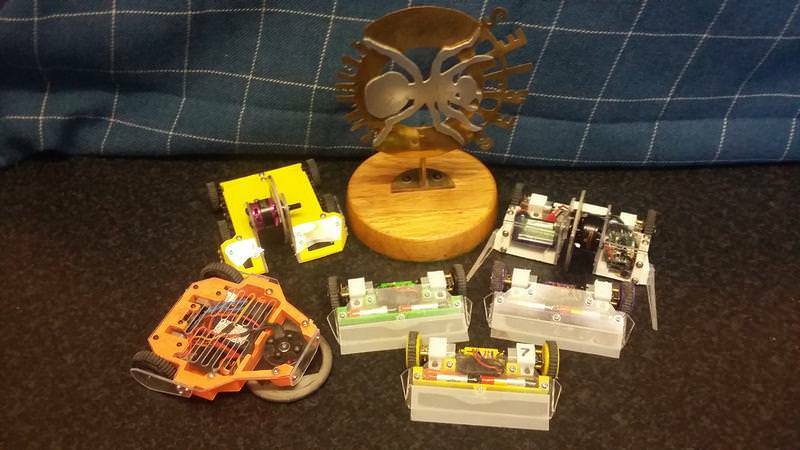 AWS 44, 45, 49, 51 & 55 Winner - Far too many robots! Looks incredible Alex; I know you'll have some big plans for it so excited to see the use it's put to. Unfortunately this won't be able to cut metal (I'd need to add about 2 zeros onto it's pricetag for that! ), I've only cut them as they were the first DXF's I found in my mammoth CAD folder. But it'll be pretty handy to check stuff like that before getting it done properly. Cut a FW out of MDF to check it all fits and works before getting it waterjetted from hardox and the like. Being more of a delicate machine than the router I can do some more detailed work with it and hopefully let me try some crazier designs with it. Ah, I see, well that's pretty cool. Good luck with it! 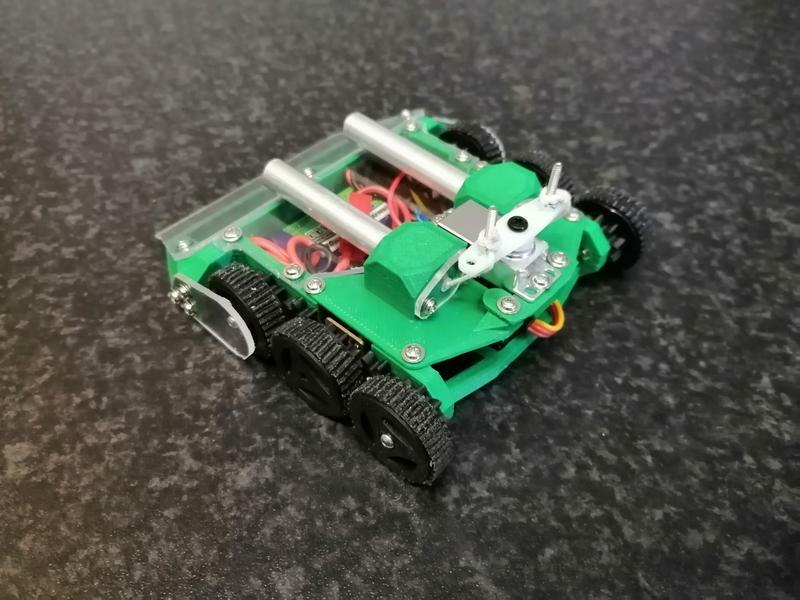 A bit late for it but throwing out a few pics of Bristol bot Builders 2. 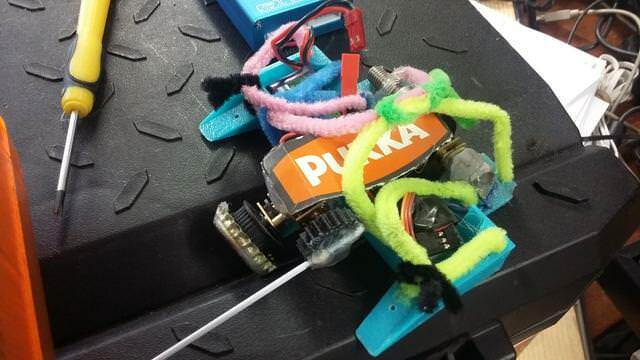 This was one of the most fun events I've been to in a long time, I joined in the bodgebots with 'Pukka', a robot more bodge than any I could do while sober. The addition of pipe cleaner decoration to help it out and a quick cut down of the lance to fit in the cube. It actually managed to win one fight! The next it just ended up driving into a pit. Test and DHMIS got to have a run around aswell, test in the 1v1's and DHMIS in the 2v2's. Jack Tweedy being the man crazy enough to tag team with DHMIS to form team 'Best Chef's. 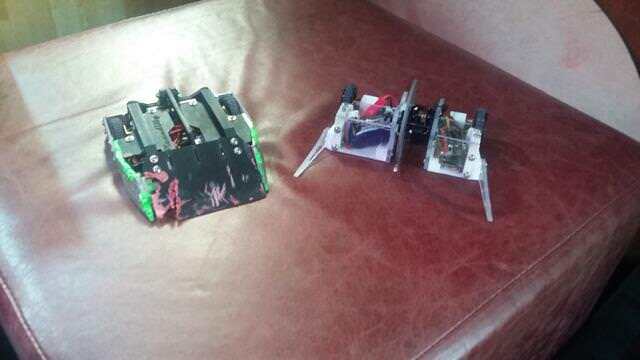 Finally a rumble was at the end including the awaited faceoff of DHMIS and Valkyrie, this redulted in some of the first actual combat damage DHMIS has received from another bot but it was definitely worth it. It was a great laid back event and I'm looking forward to the next and seeing what other robots are cooked up over there, there were some really great robots that appeared at this one including a particularly viscious vert that bested Test at its own game! 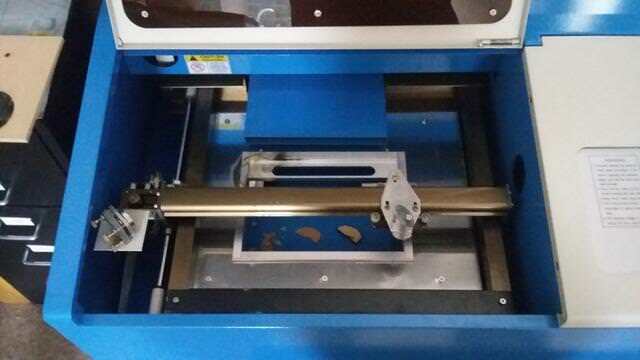 Outside of events the laser cutter is coming along, upgrade parts are arriving and the rest on their way. 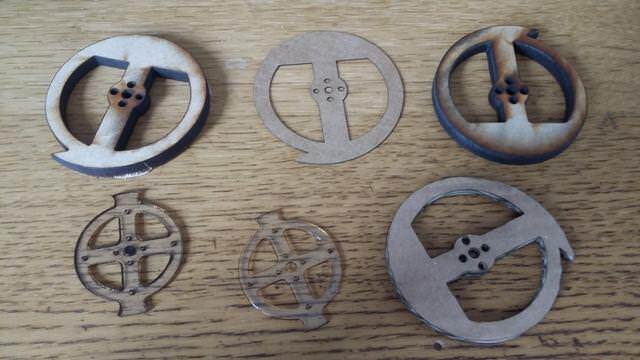 I'm looking to switch PETG in for polycarb on a few robots (specifically the shop stuff) as it is much more agreeable to laser cutting and is almost the same properties but cheaper. Partly wondering how it would hold up as arena material (It's used for the same purpose as polycarb in industry, machine guarding) though will need some testing. Post AWS 55 update! I know, late as normal but I'm feeling nostalgia for these post event posts. A fantastic event for Team Shakey finally achieving one of my goals of winning with a spinner, Test came close before but was defeated in the final by ALBOF, but this time a few tweaks and some more controlled driving got it all the way. It had a couple of pre-event improvements. New disc was cut for it as the old one had blunted, same profile. Cleanup of the wiring to save some weight and try and stamp out electrical trouble. Reshaping and thinning the bulkheads to gain weight, allow it to drive inverted (and self right without weapon) and to raise the disc slightly in the chassis to reduce the robot bouncing on hits from the disc flexing into the floor. New battery (actually couldn't fit in the same capacity one as hobbyking has changed the size, a new slightly smaller but fresh battery helped spinup). The tweaks to test really helped it out, especially key was the self righting which came in handy and really helped it stay in fights. 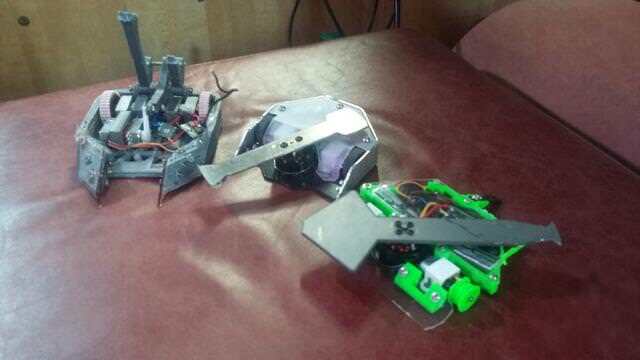 It did have one very dramatic failure when the bolts holding the disc on failed on a hit releasing it from the chassis. A scary moment but no actual damage to the bot occurred, I won the fight as a pusher using the forks to get under the other bot and hastily repaired to continue on. Still the same fun robot as always, an okay performance but it'd been so long since I fought it I'd essentially forgotten about its odd handling. Maybe a new larger disc is in order. Wedge Wedge Wedge had a pretty good run with some great opponents. Finally drew itself against EPZ slowly boiling down to a tense 1 v 1 for wedgy clusterbot honor, it was a close run fight but in the end 1 Wedge was left standing to take the win for Wedge Wedge Wedge. My two drivers for the event were George and James who did a great job, James even taking out Andy's half of EPZ. However the wedge of Considerable took both of its lives in hilarious fashion. 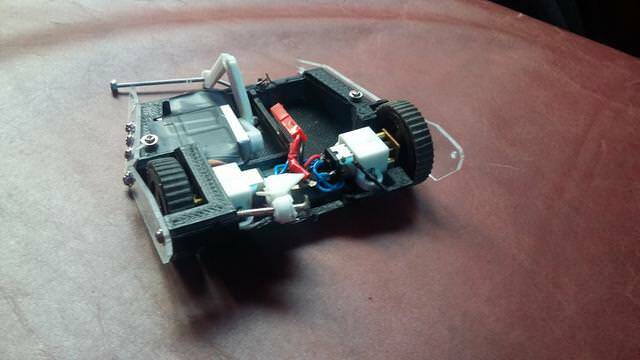 Somewhat of a test bot this robot led on from a desire to build another Hexa Chopper and from refinements made in my geared drive from doing the Crackers & Smash ants. It did well and the 60mm disc packed one hell of a punch. 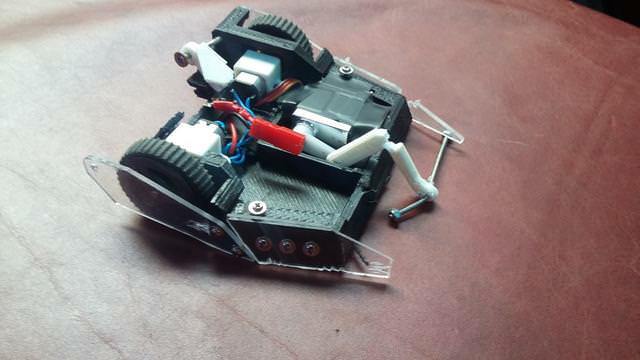 The armour for this bot was PETG in an effort to asses it. The armour held up okay but on heavy hits from boomstone started to crack, which PETG is very vulnerable to and was then shattered by valkyrie. I need some more controlled tests to asses PETG with. The drive however was letting it down a bit, though I have a plan with some tiny motors from the depths of china I bought as potential Nano Drive. I whipped up a 20g testbed with them and could push an ant, so packing 4 in an ant (weighing less than 2WD with N20's) should work nicely. An issue I regularly have when my team has 6 individual bots running in every tournament is charging. My poor single channel charger does an admirable job but often it just isn't enough. Enter the charge block! THe laser cutter put in some good work to make this happen and now I can charge 4 robots at a time. The DC4's chargers are great and this unit combines a 12V 'LED power supply' in the base with a drawer to hold charge cables. It made my life at the AWS far easier. Work were having a clearout and let us at the scrap. 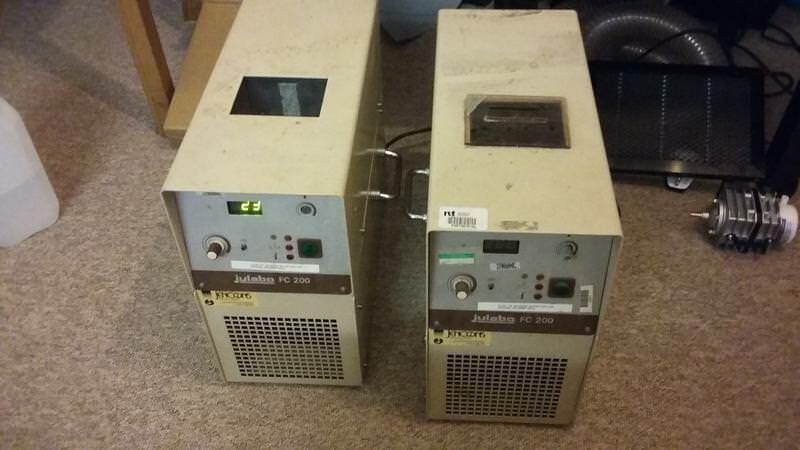 Laser cutters need fairly good cooling to run for sustained periods. Normally in the hobby lasers people just use large tanks of water to absorb the energy then allow the water to cool. However as I found (especially when ambient is high) this can allow the laser to approach too warm (only ~25-30C or so) and power levels to be very inconsistent. Luckily for me in amongst the scrap were 2 industrial water chillers capable of chilling the tube to nice temperatures and holding it there for consistent sustained operation. Of the two of them only one would power on when it arrived. 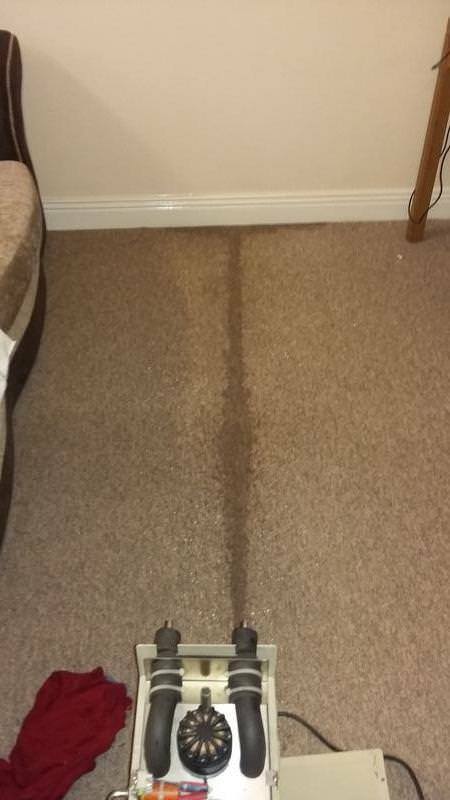 I had given them an inspection and hoovering out of dust first, one powered on but the other wouldn't and instead tripped my MCB. I focused on the working one and cleaned up before filling it with water for a chill test. Setting it with the aim of getting the water (~23c in my house) as low as it could go. At that moment I discovered they were chillers AND pumps... Very high flow pumps. My poor lounge. After grabbing some hose and putting a loop from its outlet to its inlet I set it off again. It only managed 19C however before the temp started rising again, a poor showing. An inspection showed the fan meant to draw heat off the radiator was dead, so I stole a spare off the non working chiller. And setting it off again I found... I had no temperature reading from the water. After 2 evenings of head scratching and poking, resoldering the sensor I found the culprit. A switch on the front switches the 7 segment display between what the temperature is and what it is aiming to be, that switch was just dodgy. Easy workaround... hit the switch. I set the chiller off again and went about my day until I heard a sudden pitch change from the motor. Legging it over I found it had gotton the water to 0 degrees and it was forming ice crystals, I turned it off and poured in water to bring the temp up to prevent damaging the unit. Safe to say it works. The second unit needs an electronics swap. It's an older simple machine so some mains relays connected to an arduino with an LCD screen readout should get it running again, though I have no need for a second right now so that can wait. I got this machine all happily running and over time have been doing tweaks here and there, it went through a short phase of not working due to swapping the laser head for an air assist one which wasn't a direct match. This left the laser out of focus on the bed resulting in poor cutting. I have since modded the bed and mostly got it working again but there is still work to do, some shorter threaded standoffs that hold the base with a spring adjust system (not unlike a 3d printers level adjust) should finish that off. Still haven't got around to plumbing in the new exhaust mainly due to an inability to decide where it will permanently live, it still lives in a slightly awkward spot in my lounge but as of tuesday it will be officially in the way of other things, so tomorrow evenings job is re positioning it into CNC corner with some lengths of wood to make it a new shelf below the desk. It has however been a fantastically handy tool though mostly for non direct robot combat applications but of particular help with one of this posts later entries. So i never posted them here as the two I've built aren't overly suitable for regular combat. 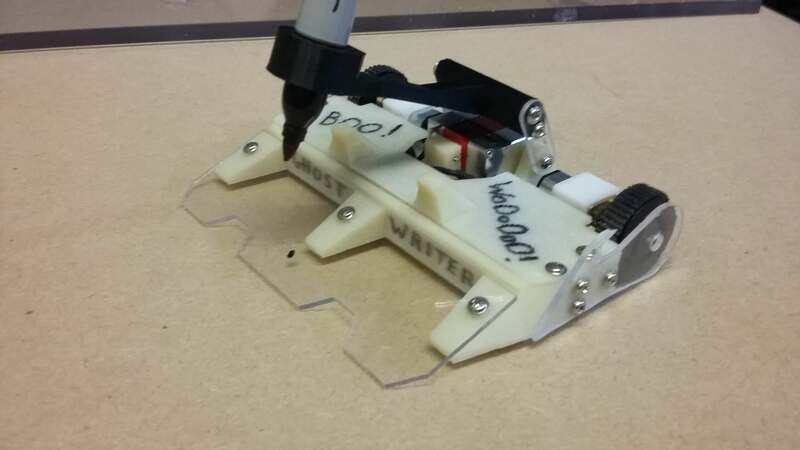 I've been hugely enjoying fighting at the Bristol Bot Builders events in recent times. Whenever I fought here I'd normally just bring the bots that'd be fun and put on a show. There's a great emphasis on unusual or quirky (almost gimmicky) robots here as there's no big tournaments at stake, just a whole lot of fun. So I've been trying to push the boat out into stranger waters and frankly getting outside the typical ruleset (With EO permission of course). The two bots that spawned from this are 'Ghost Writer' and the feared 'GlitterBot'. 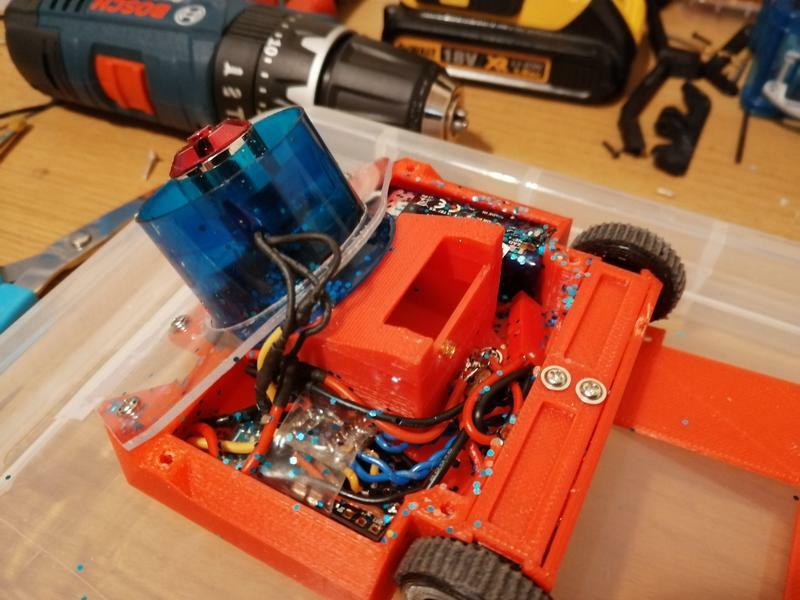 GlitterBot is possibly the most annoying robot I've ever built- For one main reason. It's weapon is purely based around using an EDF to spread ~15g of glitter around the arena and continuing to disperse it throughout a fight. It doesn't do anything else well. The original idea being to perpetuate a joke of my main opponent always being the actual arena and to bring some festive glitter to the BBB christmas event. It turns out glitter is a horribly effective weapon, when you fill the arena with enough glitter it seems N20's just can't deal with it getting glitter mashed into the gears. GlitterBot now holds a rare feat of multiple knockouts for fights it wasn't even in! The downside of this is... Well it's glitter. The last message I got of someone complaining about still finding glitter was today and have been a regular feature for over a month now. I did warn the EOs and give them a chance to veto it! Built for the halloween BBB event this glow in the dark monstrosity was born from some random drama about people drawing on robots. So I made it the main weapon, can't complain when it's done in the arena! Multiple sucessful BBB outings to draw on bots and a trip to Dorset Robot Games have allowed it to make a literal mark on many robots. From the most bodged to the shiniest none are safe. 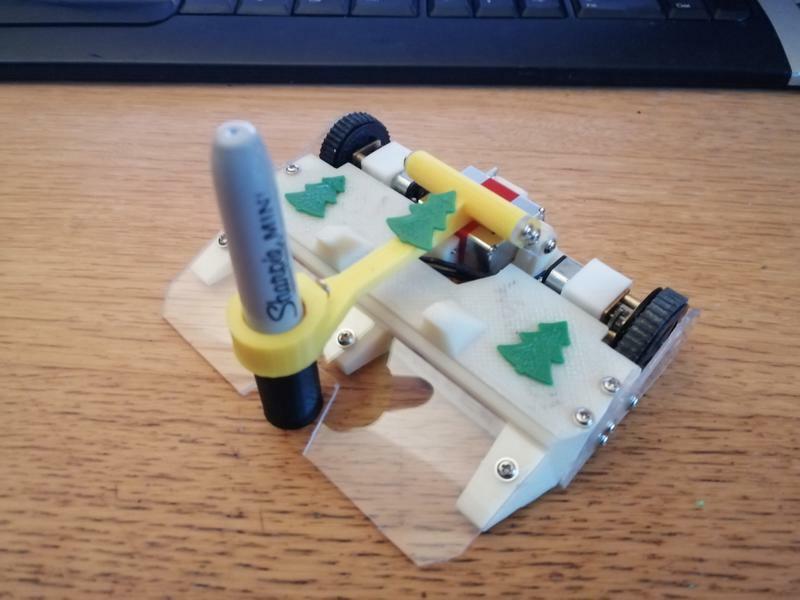 For the christmas event, because I know the BBB EO's love me and my arena ruining ways I adjusted the scoop for Ghost Writer, redubbed 'Snow Writer' for the event and now with the ability to draw on the floor as well as other robots it left a long permanent trail of sharpie behind. People seem to thoroughly enjoy the bot and it's unusual form of damage so it's become a mainstay of my BBB lineup. 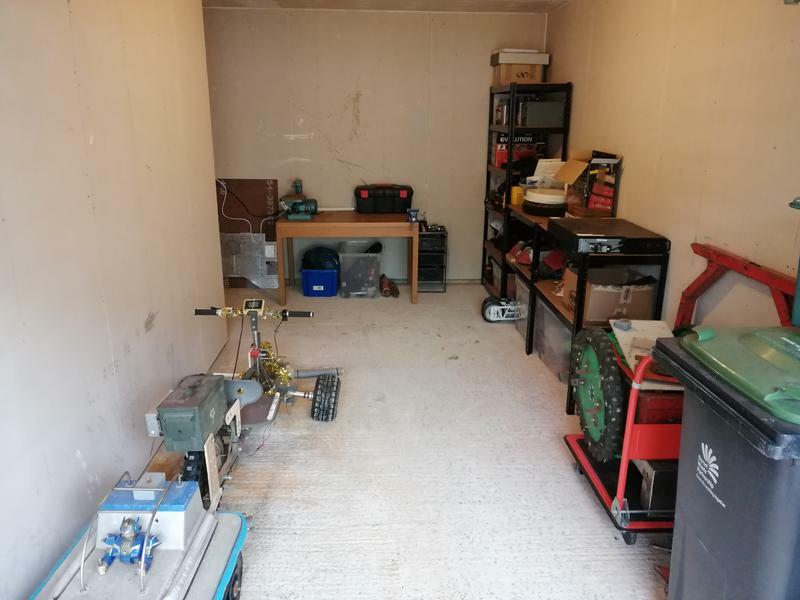 I recently organised my garage for easier building of larger things. You can see Nuts 1 hiding away aswell awaiting some much needed TLC before returning it to live events. 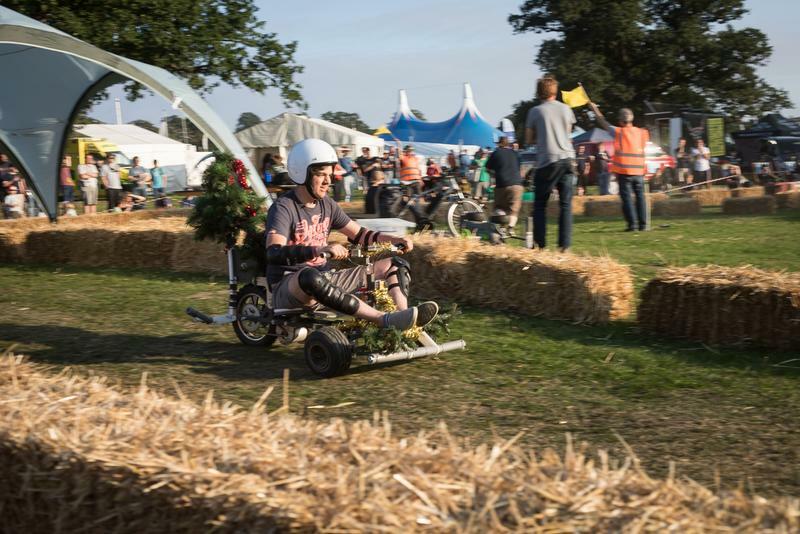 At EMF camp 2018 a new mini racing series popped up known as Hacky racers. Born from the US PPRS racing series it's a series of sub £500 novelty electric racers. Rules mainly concern safety but with requirements on size, a budget limit and most importantly a power limit limiting racers to 'nominally' ~1.4kw. 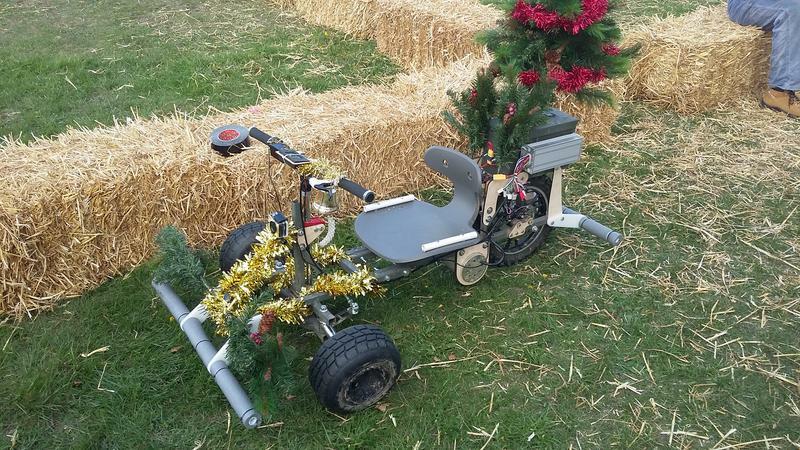 For this I built 'Trikemare before christmas', a reverse trike with a christmas tree. Powered by a brushless scooter motor, e-bike ESC and a 10S 15Ah LiPo setup it was great fun to race but was fairly prone to rolling. It had teething issues at the first 'test' run of the series 2 weeks before EMF due to rain disintegrating the largely MDF motor mounting, but upgraded to plywood and HDPE for EMF it worked very reliably over the weekend, covering many miles on track and off as a convenient run around the camp and general hauler. At one point being used to haul hay bales ~7 at a time to move the track. I do need to improve it though. 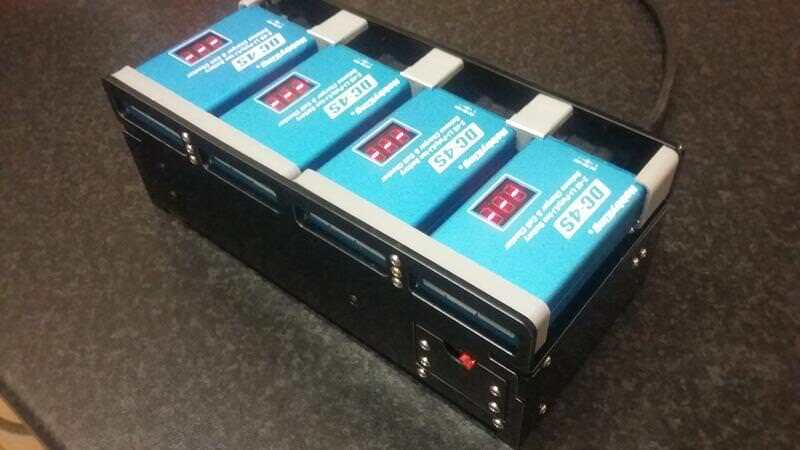 I am increasing the power with a 12S set of LiPo and an E-Bike ESC with a higher current limit. One of the most important things will be a frame rebuild to help lower the COG when racing, currently I have to lose too much speed in the corners which combined with its higher top speed (for the same power) means I can struggle to overtake. More power, more sensibly geared and able to carry more speed through corners should help it out in racing. 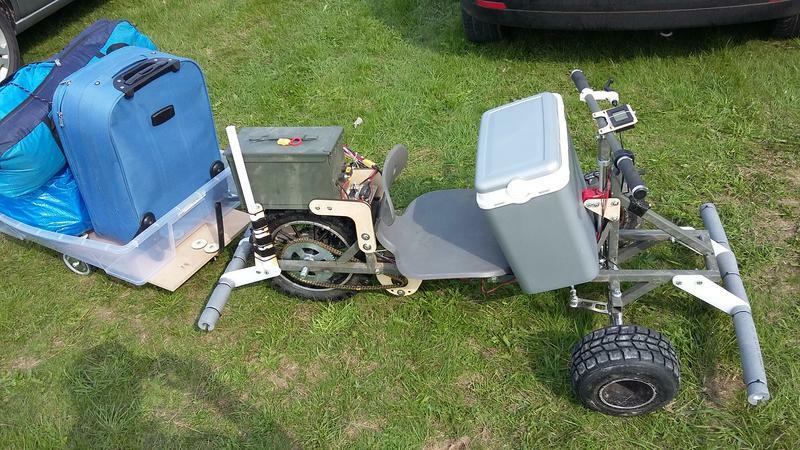 I know a 4wd one would be more sensible... but frankly I like the trike life! Ghost writer made me laugh when I saw you posted it on reddit and it still makes me smile. I've seen people posting post event pictures featuring his autographs too. Hey Shakey, the acetate strips you use for your wedges, are you just cutting a4 pieces down yourself or did you find somewhere to buy small pieces ready cut? Does a post it note style stack of adhesive acetate strips exist? That's what I want to buy. Cheers, I'm always happy when my silly bots can get a laugh! For the acetate I buy A4 strips then use a paper cutter (one of those slider types with a wheel blade) to turn it into smaller strips of varying width. 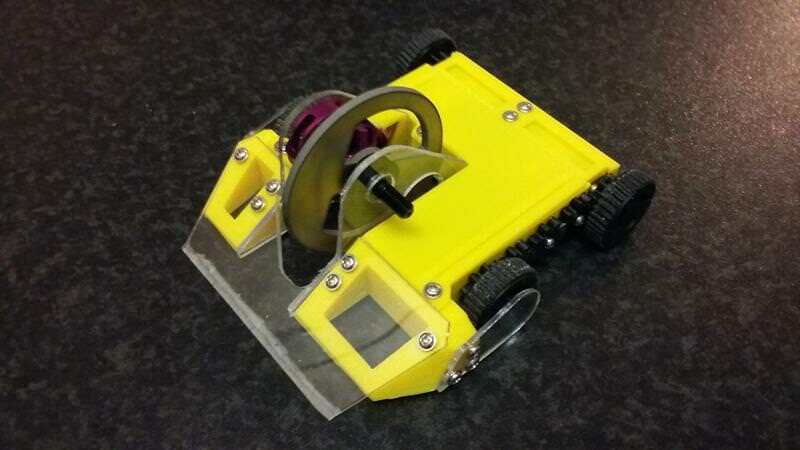 Then use 3m double sided sticky tape to apply it to bots. Not sure if there is anything that comes ready to stick though. Funnily enough I was inspired by peter rolling up to events with his preprepped acetate and it looking so much easier to deal with than sitting there with scissors trying to get a good piece at an event. Gotta say I loved both these bots. You can add me to the list of people still finding the odd bit of glitter in my bots Still Glitterbot was a lot of fun in it's own weird way. Ghost Writer is a cool concept too, I noticed others were picking up the idea. IMO it would be interesting if there were a competition with bots only having pen based weapons fighting each other & having the winner decided based on who got the most ink on their opponent. Yesterday evening I finally needed to move the laser cutter out the middle of my lounge. So I built it a shelf and it now lives happily in CNC corner with the other machines. Just need a new exhaust hose to reach a skylight above it for ventilation. A drawing rumble would be pretty fun I must admit. Never posted this bot when I built it. 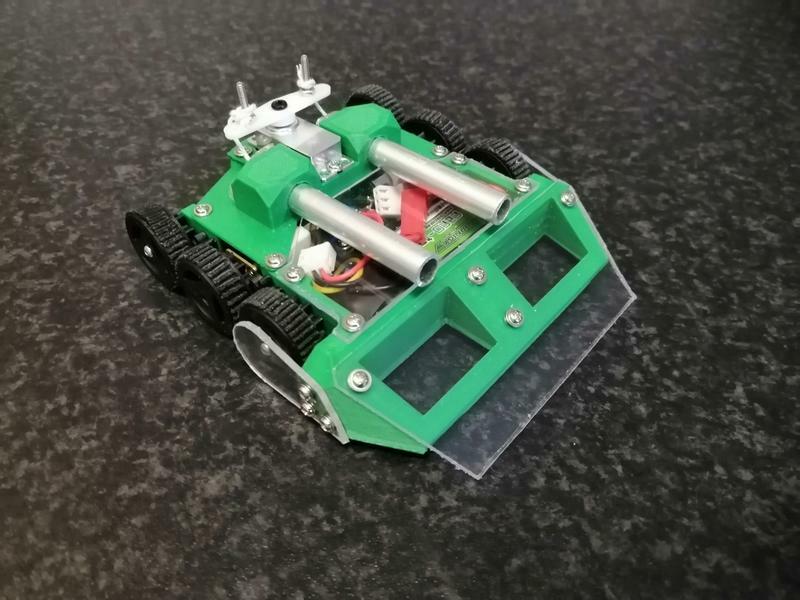 This is the next version along from Glitter EDF robot. EDF robot was fun but had a lto fo problems as it was rushed, it couldn't actually do much after sparkling up a fight! 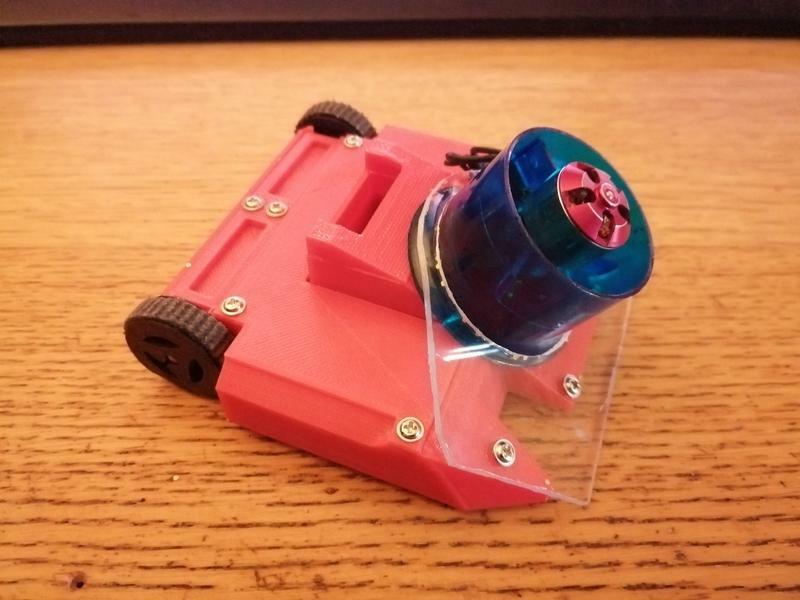 'Glitter Cannon Bot' is a much more capable ant that can push about others. Plus the added bonus of using less glitter per fight but in a much more targeted manner. Powered by the charges from party poppers pulled by the servo it has 2 shots. It breaks a good chunk of AWS rules but it's still allowed to run at BBB events.